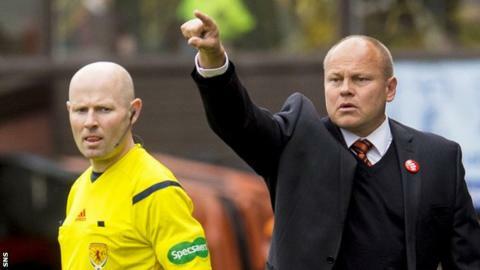 Dundee United head coach Mixu Paatelainen insists the sole objective for this season is to avoid being dragged into a relegation battle. United find themselves four points adrift at the bottom of the Premiership table and this weekend travel to Glasgow to take on champions Celtic. "We are detached already, that is the situation," the Finn told BBC Scotland. "We don't look at the league table but look at the concentration levels in training and in matches." United have won only one of their 11 league games in the current campaign. Last week they appointed 48-year-old Paatelainen on a three-year contract as successor to Jackie McNamara, who was sacked from the Tannadice post. "Our target now is to improve the way we play," he said. "I believe that the performances bring you results. You can be unlucky in one or two matches but in the long run performances give you results. "Our target this season solely is to avoid a relegation battle. Full stop." United have scored only nine league goals this season but Paatelainen believes it may not be too long before his strikers start finding the target. "I'm sure our strikers are not happy at how many goals they have scored, but it can change so quickly," he added. "One half-chance and the ball ends up in the net and the confidence is high. That is the way it goes with the strikers. "They may have a lean spell then suddenly you get a deflection or a ricochet, the ball ends up in the net and suddenly you are top of the world."